Don’t let those clouds fool you! Back in Action with Romeo and Juliet! After Sunday night’s rainout, the skies are clearing and it looks like it’ll be fine weather tonight for Romeo and Juliet in Barracks Square. The star-crossed lovers have not been so lucky with the weather gods so far, with 3 of our 5 performances having been rained out. There are only 3 remaining–tonight, Tuesday, and Thursday. So don’t delay… with the weather in these parts being what it is, if you put off coming to see us to another day, you might not see us! That goes for Hamlet in Odell Park too, which will conclude our run with performances Friday, Saturday, and Sunday. Both shows have been getting an amazing response so far! Check out our reviews at https://stureviews.wordpress.com/ and watch the trailers you can link to from this page for a taste of what you’ll see in the Square and in the Park, and see you at the shows! Though it’s not currently raining, it does threaten to later. We’re going to cancel tonight’s performance, enjoy your Sunday evening! And don’t worry, Monday night’s forecast looks favourable, so make tomorrow the night to take in this wonderful bit of theatre, in the heart of downtown Fredericton. We’re back in full force in Odell Park tonight for another performance of Hamlet! Don’t let those grey skies dissuade you from taking in some critically acclaimed, outdoor, immersive theatre. Remember, those trees act like giant umbrellas! We’re taking a day off on Thursday to rest our vocal cords and let the park dry out from Tuesday’s rain. 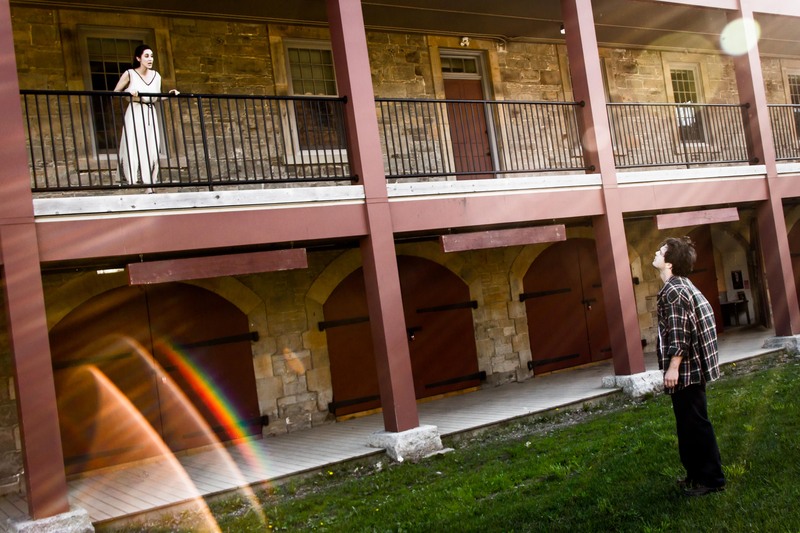 We’ll be back with performances of Hamlet in Odell Park on Friday and Saturday and Romeo and Juliet in Barracks Square on Sunday, Monday, Tuesday, and Thursday before concluding our run with three more showings of Hamlet July 3, 4, and 5. We’ve had a great response to our shows so far, with last night’s crowd at Romeo and Juliet particularly large, so we encourage you to get out to both while the weather is looking good and before we lose some of our prime seating for R & J on Tuesday! See you at Odell Park on Friday! What an unkind hour is guilty of this lamentable chance! It seems all this rain has left our playing area full of damp grass, soggy set pieces, and water. Tonight’s performance has been cancellèd! Betake thyself to see the show tomorrow night. Want to know who you’ll be watching tonight? Check out our cast and crew bios!